When it comes to building your list — attracting subscribers — the usual advice is to put a subscription form on the front page of your web site, or even force an opt-in before people can see your web site. Yeah, those strategies work, but that’s far from the end of the story. What are you doing offline to build your list — to bring in new subscribers? That’s right: offline. There’s a whole big world out here, and not everyone is seeing your online marketing. I’m talking about extremely low-cost marketing. Do you ship products? How about putting a card in with each order that tells what you have to offer? Yes, I know your customer already knows about you: they just bought from you. But they may have a friend, co-worker, or others who they might pass the card to: “I love the products from this place. Check ’em out!” Word of mouth endorsements are very valuable. Is it worth it to spend a penny or three on a card? You bet it is. And if you have more than one product line (like me), your customer on one side may not know you have another side too. That goes for retail locations, too. 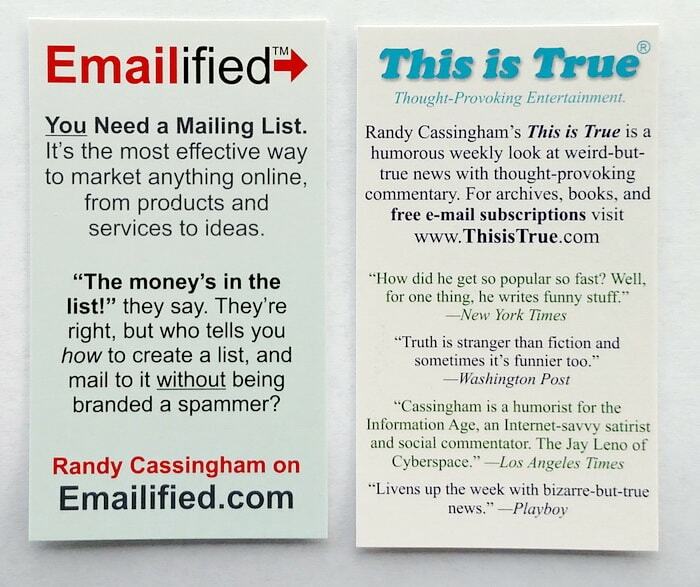 Do you have cards that customers can grab to spread the word? Either way, you’re probably printing a receipt. Is your URL automatically printed on that receipt? It should be — including mention of your email list, and why someone might want to check it out. It doesn’t have to be a detailed list of benefits, but isn’t some mention better than nothing? Here’s a couple of examples — we enclose these with every order of goods we ship out. Speaking of no-brainers, do you have a friend in a complementary business? Can you get together to provide cards to each other to put into shipments? I do that with a couple of buddies. Some of my subscription forms have a “Where Did You Hear About Us?” question, and “business card” is mentioned a lot. It’s really cheap advertising. 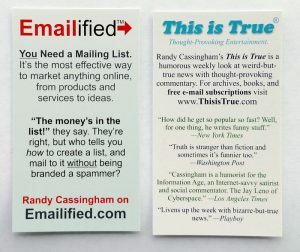 Of course, anywhere you do actually have printed advertising (local newspaper, flyers or brochures, trade magazines) be sure to mention your email list, and why people interested in your product or service might want to subscribe: “Get on our email list for monthly specials.” is short, sweet, and value-added. 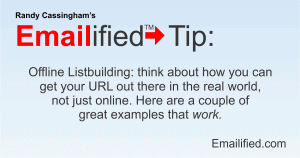 So think about how you can get your URL out there in the real world, not just online.